If the cat is the newcomer, they will need to start in a safe room. Find something that motivates the cat as a reward so that you can begin positive reinforcement exercises on either side of a visual barrier such as a baby gate, screen door, French doors, etc. If the dog is the new family member, he or she should be contained for house-breaking and training purposes. They may have the kitchen and their crate in the beginning, but they should not be allowed to barge in and take over the house, making the cat feel like a prisoner in their once safe home. We only recommend confining the cat to their favorite, safest room of the house if they are incredibly shy and intimidated, and it is in their best interest to have their world made smaller. Otherwise, the cat should have free run and the dog must be contained. Your cat may feel too intimidated to get to their food bowls, water, and especially litter box. Do not move their litter box! Instead, add resources in places where your cat feels safe. Abrupt change is stressful to cats, and a new dog is stressful enough. Give them more choices and options, not fewer. Do not allow your dog to chase, bark at, or pursue your cats in any way. Cats who run get chased because running evokes the prey drive in dogs. This can be a deadly scenario. Dogs pick up their prey and shake it. And while the owners may notice no evidence but saliva on the cat, the cat may be suffering serious internal organ damage that can be fatal. Cuddling and grooming is fine, but dogs and cats should not be allowed to wrestle or rough-house together. Create vertical space so that your cats can get up and away from the dogs. This is key for the cat’s sanity and sense of security, as well as for their safety should an unsupervised chase ever ensue. Cats take great comfort in being up high. Make sure the dog respects the cat condo; paws off for dogs! This is usually only an issue with toy and agile breeds. Create feeding stations up high so that the dogs do not scarf down all of the cats’ food. Remember that cats are the most three-dimensionally oriented species we share our homes with, so there are no hard, fast rules about the food dish being on the floor. Bathroom vanities, armoires, and cat condos are all great locations for cat food. Always offer a separate water dish for cats. They may drink from the dog bowl too, but cats are very finicky about the taste of their water, and dog slobber could taint it enough to prevent them from drinking. Put a baby gate up to keep the dog out of the litter box. Lift the gate a few inches so that cats can go under or over it. If you have a very small dog, you may have to get more creative, but know that hooded litter boxes are not the solution. Elimination is a vulnerable time for a cat, and hooded boxes can make them feel threatened because they cannot see the dog approaching. Most dogs can also fit their head inside the opening; imagine how scary that would be if you were a cat using the box! Training your dog to understand the “leave it” and “drop it” commands will allow cats to have toys, food puzzles, and free access to the litter box. Many homes with dogs are void of cat toys because the dog eats or destroys all of the cats’ things. This is extremely unfair. Do not allow this to happen to your once happy cat. Monitor your cat when your dog is eating. Cats should NOT eat dog food. It is not balanced or made for them and can cause urinary problems. 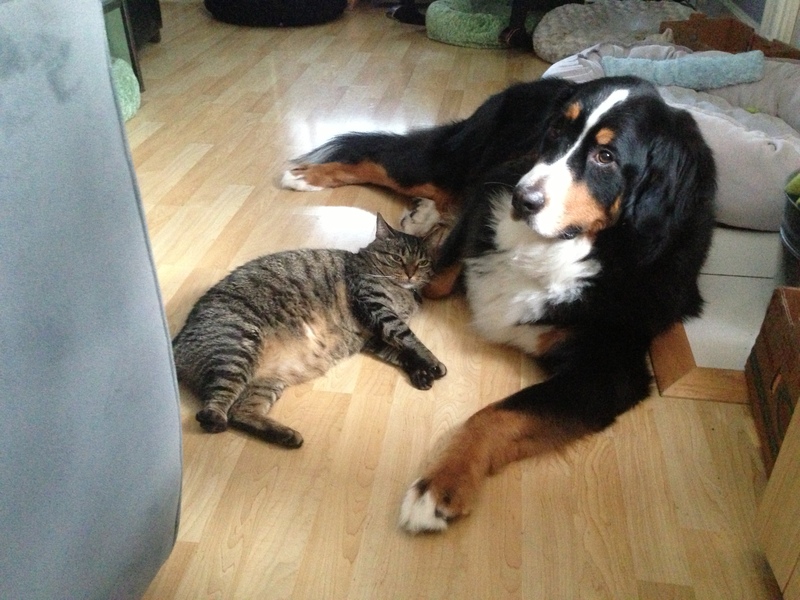 Contact between a dog and a cat should always be initiated by the cat. Even if the cat gives the dog a warning swat with a paw, the dog should not retaliate. The goal is not for the dog to be injured, but for them to realize that the cat comes equipped with sharp pointy things that should be avoided! 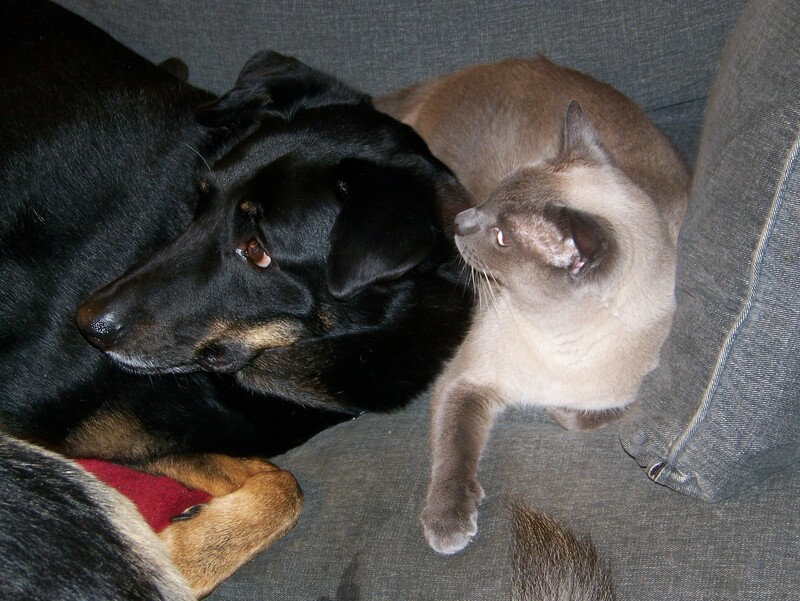 It cannot be stressed enough that supervision is imperative when introducing dogs and cats. Do not leave the dog and cat alone unsupervised until you are 100% sure the dog will not attack the cat under any circumstances. Since this is a very high expectation, and there are many cases of dogs attacking and killing the family cat after years of living together, you are wiser to keep them separated or keep the dog crated while you are not home. Dominance training, shock collars, pinch collars etc. are outdated methods that are not nearly as effective as positive techniques. Animals learn best using positive reinforcement. Reward behaviors you like, ignore behaviors you don’t. This works best for all species (humans too)! Please contact your veterinarian to get a recommendation for a positive reinforcement dog trainer in your area. Congratulations on your new addition! With the techniques described here, you can successfully introduce cats to dogs. With time and patience in the beginning, your household will have long-term harmony, and your pets will have a positive and long-lasting relationship. With a patient and careful introduction, your pets will enjoy a positive and long-lasting relationship. 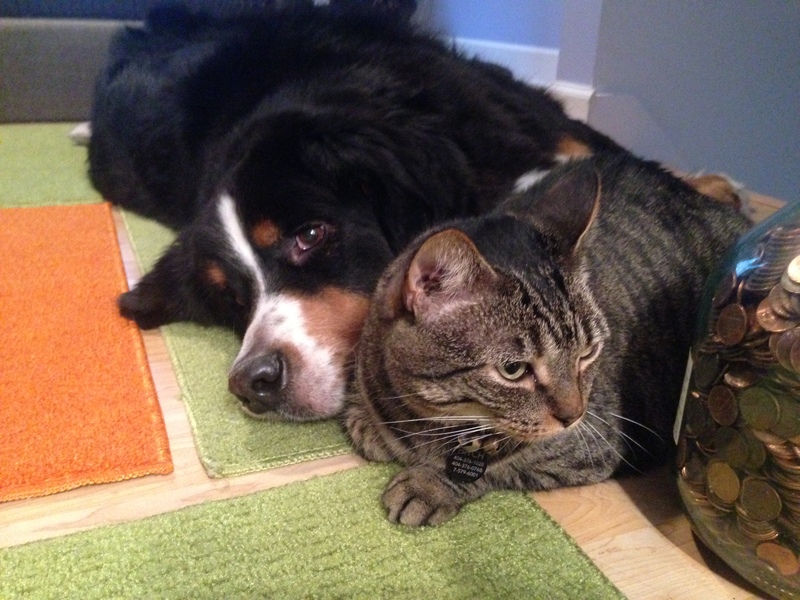 Can cats and dogs really get along? Of course they can! They can even be best friends! The first step is having a well-trained dog. Well-trained dogs are happier dogs who better understand their place in the home, and this gives you some control when it comes to introducing a new family member — a new cat, dog, or even a baby or roommate. 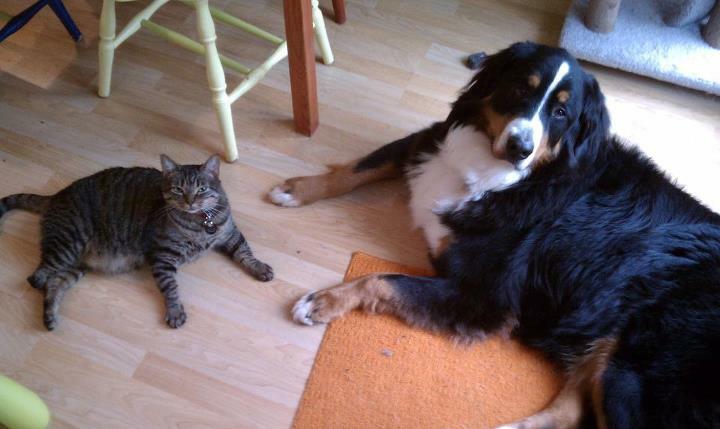 When introducing a cat and a dog, the steps described in the “How to Introduce Cats to Each Other” and “How to Introduce a Cat to a New Environment” handouts should still be followed. Take it slow, end on a positive note, and use high-value rewards when they are in the presence of one another. Elsa and Hitch. Best friends. 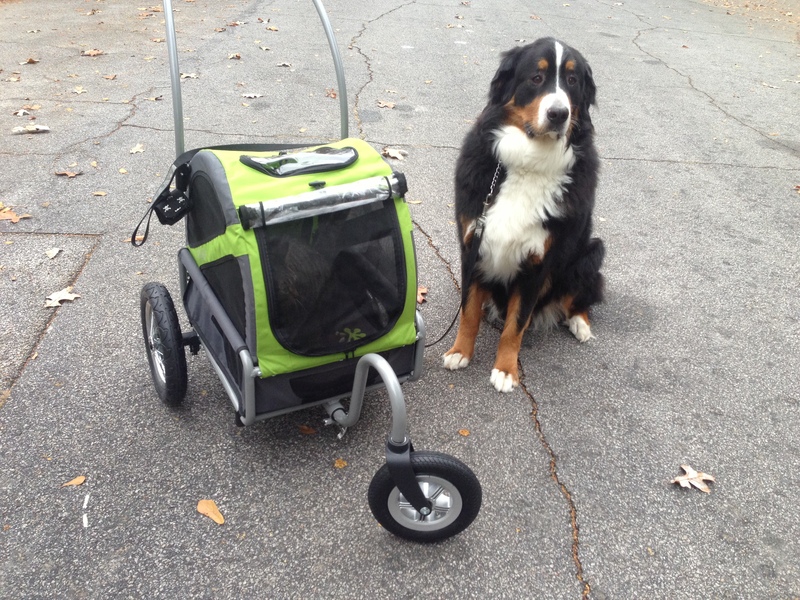 Of course bring the dog along on your stroller rides!